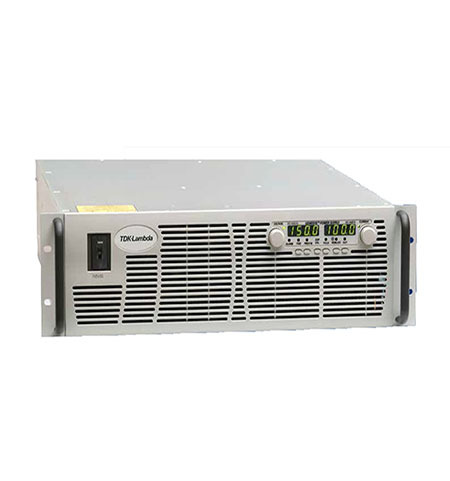 TDK-Lambda Genesys 3U AC-DC 800V-1500V Series / Tmetrix Inc.
Wider AC Input Voltage range for 400VAC Input (342VAC – 440VAC). • Cooling Fan speed control (for reduced audible noise and longer life). • High Efficiency ( > 93%). • Fast Up/Down Programming Response Time (17ms / 20ms). • Output Isolation to 1500V. • Built-In Isolated J1 Remote Analog 5V/10V Program/Monitor. • Safe/Auto Re-Start and Last Setting Memory. • Built-In Protective functions (OVP, UVL, FOLD, OTP, AC-FAIL). • Two-Wire “Basic” and “Advanced” Parallel current share. • Built-in RS-232/RS-485 Multi-Drop Digital and Remote Analog Program/Monitor interfaces. • Optional LAN, GPIB and Isolated-Analog (4-20mA) Programming interfaces. • Lighter weight (< 70 lbs). Categories: AC Power Supply, Bipolar Power, DC Power Supply, TDK-Lambda Americas Inc.. Carrying a five-year warranty, the TDK-Lambda Genesys™ High Voltage models have the same front panel features and compact dimensions (3U (133mm) high and 19” (483mm) wide) as the standard 10kW/15kW models (7.5V to 600V). These units can operate in either Constant-Voltage (CV) or Constant-Current (CC) mode and can accept a three-phase AC input of either 400VAC or 480VAC (with standard passive Power Factor Correction). As with all of the TDK-Lambda Genesys™ programmable power supplies, several safety and advanced system configuration features are included. Safety features included are Safe/Auto Re-Start, Last-Setting Memory and Built-in protective functions. 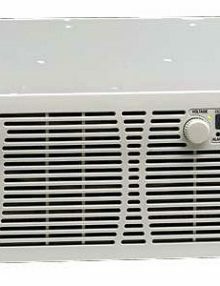 With Safe Start configured, the power supply returns to its last operation settings after a power interruption but with the Output disabled, while with Auto Re-Start, the power supply returns to the last used operation settings after a power interruption. Last Setting Memory retains settings such as the Output voltage/current, Output ON/OFF, OVP/UVL level, Foldback and Start-Up mode at each AC Input turn-off sequence. Built-in protective functions include Over- Voltage Protection (OVP), Under-Voltage-Limit (UVL), FOLDback protection (FOLD) and Over-Temperature Protection (OTP). Higher power systems can be configured using the Master/Slave “Advanced” Parallel operating mode (utilizing Two-Wire current share). This mode configures the Master unit to be the single –point for programming, measurement and status of the total current of the paralleled system. Thus, four units can operate as a single 40kW or 60kW power supply, increasing the flexibility for system designers. Common to the entire TDK-Lambda Genesys™ family is the embedded 16-bit RS-232/RS-485 Multi-Drop Digital communication interface. Using this Digital communication interface, up to 31 power supplies may be controlled in an addressed RS-485 daisy-chain configuration. Other optional Digital and Analog communication interfaces include the LXI Class C compliant LAN and the IEEE (488.2 and SCPI-compliant) Multi-Drop Digital communication interfaces (which include a selection of instrument drivers such as NI LabVIEW and NI LabWindows™) as well as a 4-20mA Isolated Analog programming/monitor interface. CE marked in accordance with the Low Voltage Directive, the TDK-Lambda Genesys™ 3U 10kW/15kW Power Supply Series conforms to conducted and radiated EMI in accordance with EN55011A and FCC Part 15J-A. Industrial, Automotive, Alternative Energy, Oil & Gas, Lighting and Semiconductor markets including Motor test, EV component test/burn-in, Photovoltaic inverter test, Down-Hole DC power, Lighting systems and Semiconductor component test/burn-in. • Wider AC Input Voltage range for 400VAC Input (342VAC – 440VAC). 30 Volts, 80 Amps, Genesys full rack 1U 2.4kW power supply. CE, RS485/232 standard, MD slave standard, Linking cable (50cm) included. ROHS compliant. 60 Volts, 40 Amps, Genesys full rack 1U 2.4kW power supply. CE, RS485/232 standard, MD slave standard, Linking cable (50cm) included. ROHS compliant. Isolated Analog Programming 4-20mA option installed, INPUT 85-265 VAC, 47-63Hz. No Power cord provided. 5 year Warranty. 150 Volts, 16 Amps, Genesys full rack 1U 2.4kW power supply. CE, RS485/232 standard, MD slave standard, Linking cable (50cm) included. ROHS compliant. Isolated Analog Programming 0-5V, 0-10V User Selectable option installed, INPUT 85-265 VAC, 47-63Hz. No Power cord provided. 5 year Warranty. Canadian Electrical Authority approved. 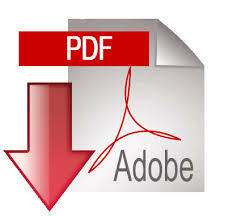 Compliance Cert must be ordered separatly if required. 10 Volts, 1000 Amps, Genesys full rack 3U 10kW power supply. CE, RS485/232 standard, MD slave standard, Linking cable (50cm) included. ROHS compliant. LAN Interface – LXI Compliant option installed, INPUT 180-253 VAC, 3 Phase . 5 year Warranty.